Product Description Determines oxidation stability of mineral transformer oils by measuring the amount of sludge and acid formed under prescribed accelerated aging conditions. The Koehler K12100 Oxidation Stability of Mineral Insulating Oils is a constant temperature oil bath for testing oxidation stability of mineral insulating oils. 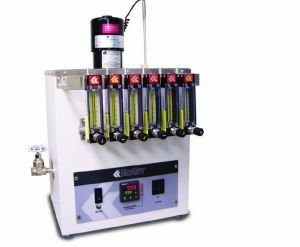 Immerses six oil receptacles at the required depth per ASTM specifications at 110°C ± 0.5°C, and controls oxygen flow to each sample at the rate of 1L/h ± 0.1L/h through six independent flowmeters mounted on a common manifold. Insulated double-wall stainless steel bath has microprocessor temperature control with °C/°F switchable digital setpoint and display. Operator and equipment are protected by an overtemperature control circuit which automatically interrupts power to the unit when bath temperature exceeds a programmed cut-off point. Communications software (RS232, etc. ), ramp-to-set and other enhanced features are available as extra cost options. Contact your Koehler representative for information. Order bath thermometer drying tower and catalyst separately. K12130 Copper Catalyst Coils - Sealed in a glass jar with a nitrogen atmoshpere. Pack of 24 (12 sets). 332-005-010 Drying Tower, 250mL - With ground glass stopper and side tubes. 355-001-001 White Technical Oil. 1 gal container. 355-001-003 White Technical Oil. 5 gal container.